In the current study, the research team investigated if coffee and tea consumption may lead to epigenetic changes. Previous studies have suggested that both coffee and tea play a key role in modulating disease risk in humans by suppressing tumor progression, decreasing inflammation, and influencing estrogen metabolism, mechanisms that may be mediated by epigenetic changes. 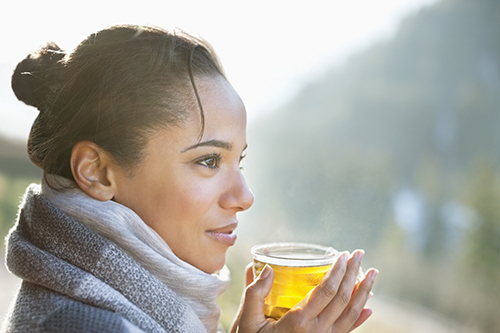 The results showed that there are epigenetic changes in women consuming tea, but not in men. Interestingly, many of these epigenetic changes were found in genes involved in cancer and estrogen metabolism. However, the study did not find any epigenetic changes in individuals drinking coffee. The findings from this study highlight the role of pharmacologically active components in tea being involved in cancer and estrogen metabolism, which can reflect that health effects related to tea consumption might be due to epigenetic changes. It has previously been demonstrated that compounds in tea called catechins lead to epigenetic changes in vitro and in cultured cancer cells, arguing that some of the health effects of tea may be mediated by epigenetics. However, this study did not provide evidence to support whether it is healthy or not to drink tea—further research is needed to understand how the epigenetic changes found in this study affect human health.